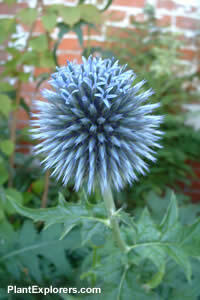 The prickly, grey-green leaves and powder-blue pompon flowers of this variety of globe thistle make it a striking architectural plant for the back of a summer border. It also works well planted in drifts in a wild garden. The flowers attract large numbers of bees, butterflies and other insects, and can be dried for winter decoration if cut while immature. Height to four feet. Landscape Uses: Accent plant, Attract butterflies, Cut flower or foliage, Dried flower or fruit, Dryland (no watering), Fall interest, Perennial border, Specimen plant, Summer interest The genus Echinops is now in the family Compositae. For maximum freshness, please keep seed refrigerated in its original packaging until it is time to plant. Sow seed in a seedbed in mid-spring. Grow in lean, well-drained soil in full sun. Lift and divide overcrowded groups in autumn or spring.